The owner’s cabin is a perfect place to watch the sunset from a unique place designed for him. From there he can reach the feeling of a higher power, surrounded by the immensity of the sea and the sky, reaching the clouds where everything reflects his place in the world: at the top. Furthermore the infinty pool produces a visual effect of water with no boundary, merging with the sky. In this way the owner will have the sensation to be in the heaven. The materials and textures chosen carefully by the designer - inspired by the most important fashion houses in Italy- reflects a 100% Italian designer. 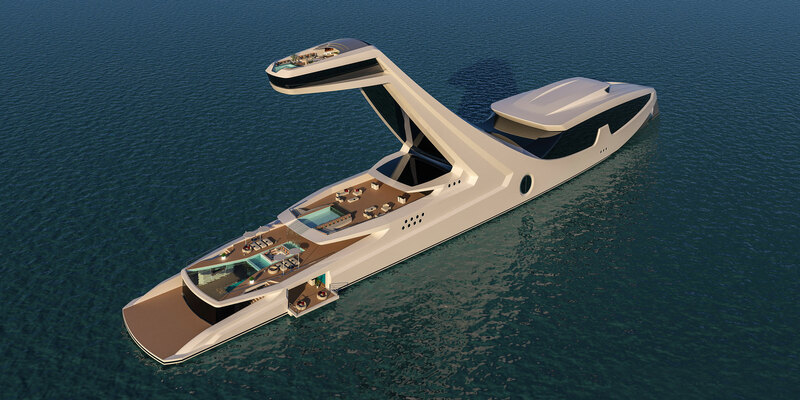 The color combinations and distributions of spaces allow a walk on this yacht where the dreams and desires becomes real. 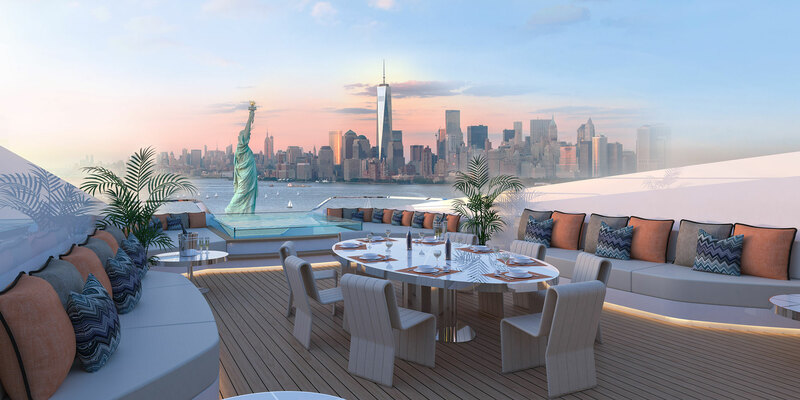 The beach club and the main aft deck have a strong connection thanks to the scenographic infinity pool situated on the main aft deck, which joins them. 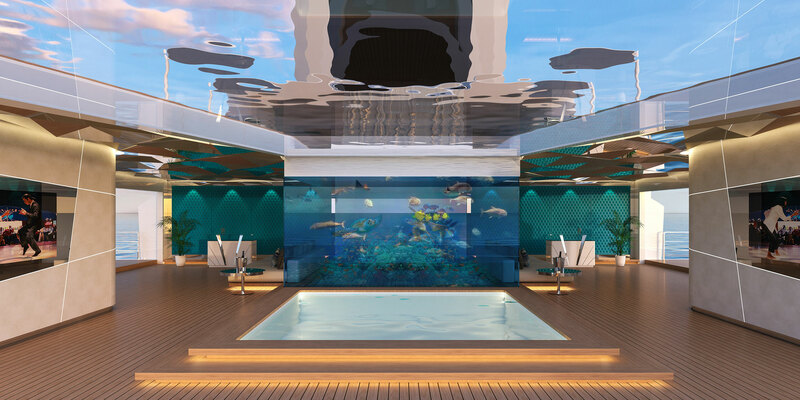 This pool becomes in this way the ceiling of Beach club, giving an airy and freshness feeling to it. Inspired to the most luxury and exclusive club, the Beach club is a place that talks to your senses, from the materials to the distribution of the spaces. 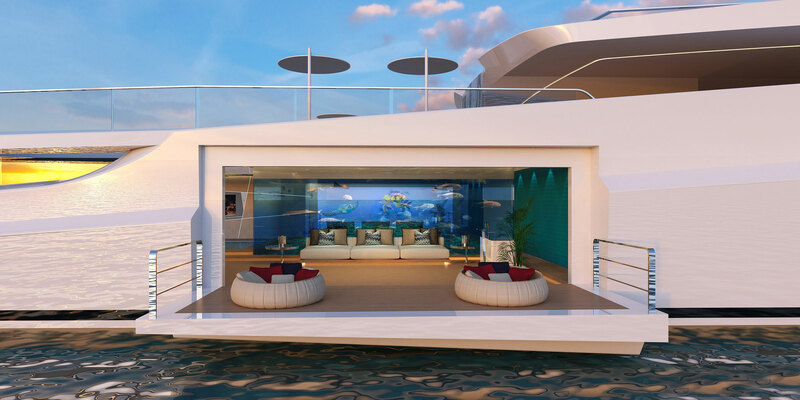 The aquarium in the middle of the room divides but also creates a union between the two sides of the yacht. The teal color of the two main walls, halfway between blue and green has a strong personality and distinctive character, very common in the fashion and luxury industry to show elegance. The main aft deck is a very refined place, where the owner can enjoy of a sense of peace of mind. The sound of the waterfall that falls from the infinity pool situated on the upperdeck helps the owner to be transported in this journey of emotions. 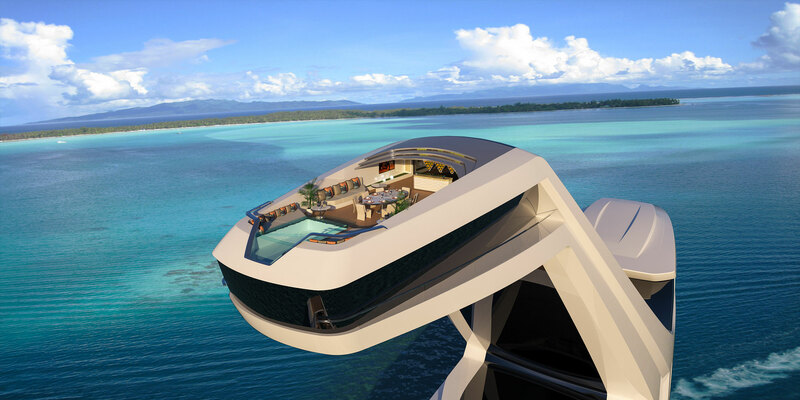 105 sq meters of Private terrace on suspended cabin. 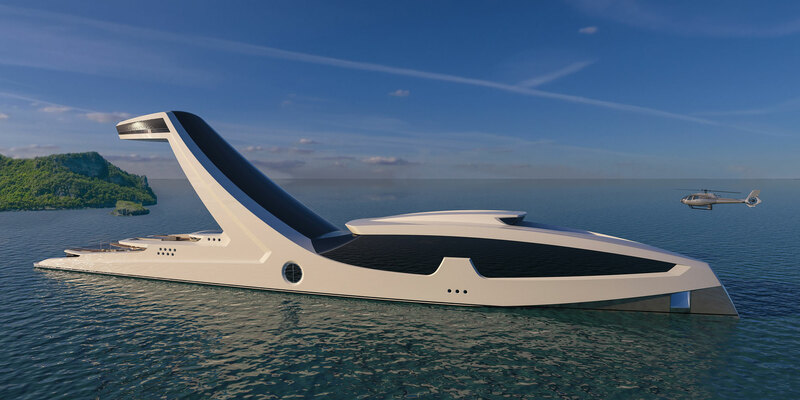 Designing visionary yachts, going beyond your wildest dreams.